Pure Steam. Clean Steam. One Atmosphere Boilers generate superheated steam that is free of contaminants. The OAB’s steam is ideal for pharmaceutical, cosmetics and other industries requiring the highest quality steam. OAB® steam is also suitable for use as utility steam in many applications due to its high energy content. MHI’s One Atmosphere Boiler superheated steam boiler features patented InstaSteam™ technology, allowing for rapid startup times, unparalleled efficiencies and up to 1300°C temperatures. BoilerFree™ technology allows most OAB® units to be installed without the need for traditional boiler certifications. The OAB® is ideal for use as an industrial steam generator, for dewrinkling operations, superheated steam drying and dozens of other specific applications requiring a high efficiency boiler that does not require boiler certifications. So many great uses in packaging, textiles, drying and more. Steam Applications. Compare Efficiency. Three types of efficiencies are important to consider. (1) the efficiency of the steam generation device where the OAB® and MightySteam® excel; (2) the efficiency of the downstream process that the steam is used for; and (3) the overall water usage efficiency and propensity to recycle the water. The one atmosphere steam-gas generator/boiler performs well in all three categories. Controls: Please check with MHI as several control features in addition to the power controller are feasible for the temperature and flow rate. Plug N Play – The OAB® devices are very user friendly. Standard 1.5″ NPT Nozzle, easy connectors in the back, for power source and OAB® Control Panels. Transforming Steam Technology For Significant Energy and Water Savings. Savings efficiencies reported are from On to Off condition. No requirement to heat any tubes or nozzles to produce steam. Conventional boilers are never 100% dry. The old conventional boilers heat loss causes steam to condense and become wet as it travels down the steam line. A decrease in steam dryness hinders heat transfer; it is, therefore, important to monitor steam dryness in order to provide optimum heating efficiency for your system. 5 Kg/hr Steam ~ 4-6 kW Single Phase Model depends on options chosen. Easy to attach pipes or superchargers (economisers). Uniquely configured K type clamp connectors make it easy to attach the steam pipe to any chamber or device. Easy to split the steam direction. How does one increase the rate of production for many steam applications from drying to improved product efficiency? Better conversion factors allow the OAB® units to use less resources to produce more steam. A standard OAB® steam output at 350°C, is almost at the theoretical efficiency of power conversion for the OAB® steam generation! The OAB’s rapid start-up (generally with a minute from cold start) also adds considerably to the overall lowering of energy usage. No moisture is noted even at start-up. water flow (analog and digital) are provided. are needed a quad BPE is used. corresponding higher kinetics. The output velocity of the 550°C OAB® steam is very high – almost 40m/s or more. This feature is used for the uniform heating of kettles/heat exchangers and for reaching large piping distances without significant loss of temperature. For industrial vats and kettles, the heating rate makes a considerable difference to the overall process economics. A general rule of thumb of productivity from traditional pressure boilers is – (0.35 Gallons of heated product like water)/kWhr. For the OAB-4® it is closer to – (1 Gallon/kWhr) i.e. almost three times (numbers may be lower or higher as they are situational dependent and one needs to evaluate on a case by case basis). Industries served for during. Please also see Single Phase OAB and Airtorch. full data logging, on-screen data acquisition display and a repertoire of 100 programs – all in the small sophisticated control panel. Steam Reaction? 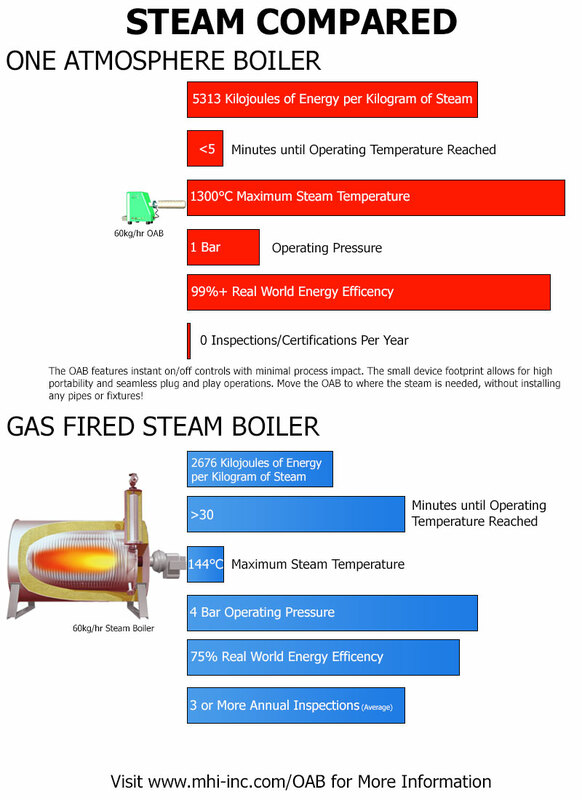 OAB® Compared to Traditional Boilers. How do Temperature and Pressure Impact a Steam Reaction? Steam Calculator, Productivity Enhancement and FAQ’s |Physical Properties of Moist Air/Gas | What are Steam and Humidity?